Galileo semi-dry electroblotters provide quick and efficient transfer of nucleic acids and proteins from agarose or acrylamide gels. Since only the tranfer "sandwich" of gel, membrane and blotting papers must be kept wet, much less buffer is required than traditional tank transfer systems. Solid plate style electrodes (stainless steel cathode and platinum anode) assure even and complete molecular transfer. Low cost and quick transfer times make this system is ideal for the rapid blotting of small pre-cast and self-cast gels. The 1010-SDBLT device will easily accomodate almost all pre-cast gels, and for many larger format pre-cast gels, once the stacking area of the gel is removed the "working" area of will also fit easily into the 1010-SDBLT device. System is supplied complete with power leads and a sample pack of our ultra-pure cotton fiber filter paper. 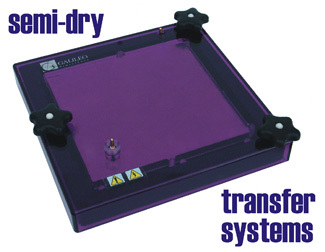 The larger format 2020 system is ideal for transfer of larger gels or simultaneous transfer of multiple smaller gels. System is supplied complete with power leads and a sample pack of our ultra-pure cotton fiber filter paper. High Desert Bio buffers offer great reliability, convenience and price.